While watching The Remaining -- a fitfully exciting indie thriller best described as a Christian horror flick -- I couldn't help thinking about Left Behind. No, not the upcoming Nicolas Cage movie due in theaters Oct. 3. Rather, I mean an earlier film drawn from the same source material -- a series of popular books by Tim F. LaHaye and Jerry B. Jenkins -- but produced on a significantly smaller budget. 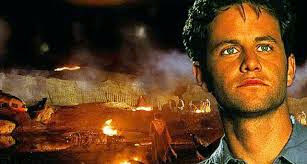 Kirk Cameron, all grown up since his days on TV’s Growing Pains, plays Buck Williams, a TV news reporter who always manages to be where the action is. In the opening scenes, he just happens to be in Israel, interviewing a scientist who has found a way to grow food in arid land, when Iraqi fighter jets suddenly darken the sky. Fortunately – well, OK, miraculously – the invaders are blasted to kingdom come even before the Israeli air force can launch a counterattack. Later, our hero is aboard a commercial airliner piloted by workaholic captain Rayford Steele (Brad Johnson) when the long-awaited, Biblically-prophesized “rapture” occurs. Dozens of passengers (including every child on board) simply vanish from the plane, leaving behind clothing, frantic parents and discombobulated fellow flyers. Tens of millions of similar vanishings occur throughout the world, though Left Behind -- obviously hampered by budgetary restraints -– can offer only fleeting glimpses of the collateral damage caused by this phenomenon. Steele returns to his Chicago home to find his deeply religious wife and their young son are among the missing, and his college-age daughter, Chloe (Janaya Stephens), is terribly upset. Slowly, reluctantly, Steele begins to suspect that his wife, their son and millions of other folks have been brought to heaven by God to avoid the horrors of “end days.” (Not to be confused with End of Days, which millions of people managed to avoid without God’s help.) Williams takes a different route to solving the mystery of the missing millions. But he reaches the same conclusion after he links a couple of international bankers and a possible Antichrist to that notorious hotbed of ungodly and one-worldly activity, the United Nations. Aimed squarely at that segment of the Christian community that eagerly (perhaps impatiently) awaits the Final Judgment, Left Behind is a pulpy melodrama that does a reasonably efficient job of preaching to the converted. (To damn it with faint praise: It’s much better crafted than The Omega Code, a similar doomsday drama about the emergence of the Antichrist.) Trouble is, it’s no great shakes as secular entertainment.